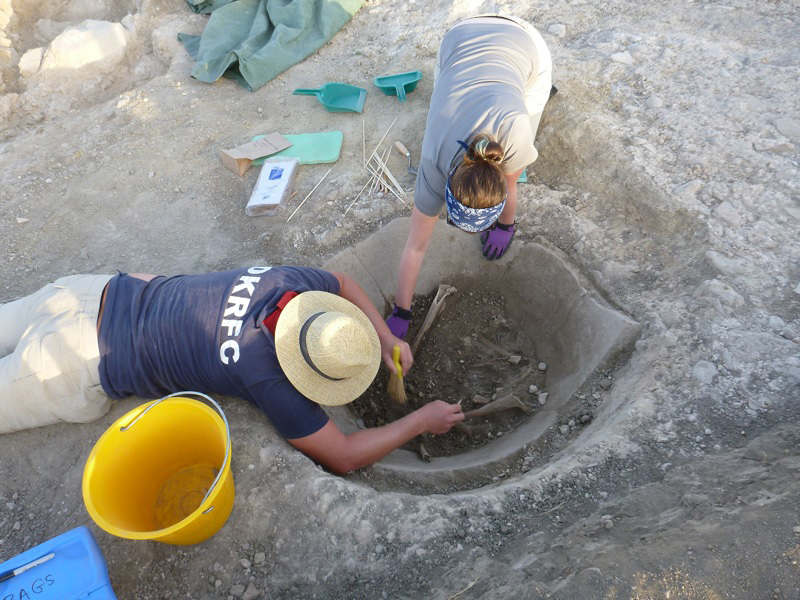 Excavating wine vat containing two human skeletons in its fill. Credit: M. Carroll. Archaeologists from the University of Sheffield have uncovered a unique insight into the life of the Roman Empire’s most prominent landowners. Until now, very little was known about Rome’s Imperial leaders aside from their battle triumphs, territorial conquests and monumental legacies. Researchers from the University of Sheffield’s Department of Archaeology investigating the vast Imperial estate of Vagnari in Italy, have now unearthed evidence of wine production on an industrial scale – shedding light on their home life away from the battlefield. The scale of the wine production provides clear evidence for industrial activities and provides a glimpse into the range of specialist crafts and industries practised by residents – painting a better and more complete picture of life on the Imperial estate and the wealth it provided for its owner. Maureen Carroll, Professor of Roman Archaeology at the University of Sheffield, said: “Before we began our work only a small part of the vicus, which is at the heart of the estate and its administrative core, had been explored though the general size and outline of the village had been indicated by geophysics and test-trenching. “The discovery that lead was being processed here at Vagnari is also particularly revealing about the environment in which the inhabitants of the village lived and potential health risks to which they were exposed. “Scrap lead found during excavation consisted of roughly torn and cut pieces taken from other objects such as pipes, vessels and tools which had been collected to be re-worked. The substantial amounts of molten lumps of lead and smelting debris show that this activity was intensive. After the Roman conquest of the region in the 3rd century BC, Vagnari was linked to Rome by one of Italy’s main Roman roads, the Via Appia. Excavation and survey by British, Canadian and Italian universities since 2000 have furnished evidence for a large territory that was acquired by the Roman emperor and transformed into imperial landholdings at some point in the early 1st century AD. Professor Carroll added: “Few Imperial estates in Italy have been investigated archeologically, so it is particularly gratifying that our investigations at Vagnari will make a significant contribution to the understanding of Roman elite involvement in the exploitation of the environment and control over free and slave labour from the early 1st century AD. “We now aim to determine how diverse the estate’s economy was, and how the cultivation of vines and wine-making fitted in to the emperor’s wider agricultural and industrial landscape.